View before folks start pulling these vids from You Tube! Sidenote: Adele was so smooth and understated, but she got outsung last night (hence no standing ovation, I suppose?). Still love her, but I did wonder – when she’s measured against the vocal masterclass acts of Bassey and the Barbz (see below) instead of the current pop stars of the 21st century – she didn’t rise to the top of the greatest songstresses. These musical numbers definitely made up for Argo taking the Big Prize. This is the first time I saw all the Best Picture nominees, and trust when I say that Argo was DEFINITELY NOT the Best Picture of 2012 (I can name at least three nominated movies that were definitely better – Lincoln, Life of Pi, Zero Dark Thirty). Heck, why stop there? Amour, Les Miserables, Django Unchained, and Beasts of the Southern Wild made deeper impressions, IMO. There ya’ go! I rank Argo just above Silver Lining’s Playbook. Best Picture … Pfttt! What Are We Getting That’s New? 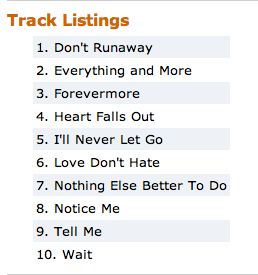 Now that Amazon.com has given us the “Track list” for No Matter How Far, are we getting any real “new music”? Some of these look like they’ve appeared on Forevermore, no? Where is the Realness? Where is the Magic? Last night’s show of Idol in Vegas – featuring the guys who made the Top 40 vying for a Top 20 position – was all sorts of horrible. In yet another desperate bid to cram a bunch of awful-sounding male contestants to prop up their chances for a girl winner (and by translation, another potential “Kelly Clarkson” or “Carrie Underwood” to reach pop star status), American Idol proves once again how shortsighted they’ve always been in presenting potential music stars. Ironically, I’m actually in agreement with the folks over at Vote for the Worst. Basically, VFTW claims, Idol will never get another female winner, and these crazy plans of theirs might really blow up in the faces of TPTB when they saddle themselves with a most inappropriate and completely unmarketable Idol winner. Can’t you just see all the talented girl contestants voted off week after week while a Charlie Askew makes it to the finale? Oy veh! And, this, ladies and gentlemen, is why David Archuleta must struggle against the Idol lable. When the most respected contestants are the female contestants, who back in the day could rise to victory but nowadays get taken out by the most mediocre cute boy that Idol voters fall head over heels for, is it any wonder why folks get distracted by David’s good looks and downplay his ginormous talent? Mistaking him for any number of mediocre Idol boys? Lightning really, truly, DOESN’T STRIKE TWICE! We will never get another David Archuleta (and even though poor, stammering Lazaro Arbos is trying really hard to channel my favorite Idol, he’s going to lose viewers like me pretty quickly if he keeps trying to copy David – by singing songs like “Angels” or “Bridge Over Troubled Water” – and fails to live up to the original). Newsflash, my beautiful Stammerer: The art of being a great Side-Idol is to never imitate and live up to the Main Man in someone’s life. The art of the Side-Idol is to resonate oh-so-slightly with the original while daring to bring something new and different. I’m afraid, next week, Lazaro Arbos won’t fulfill the void. Sigh. Still, I want some entertainment. I want some realness. I want some magic. Magic! Magic! Re-watching David’s “Heaven” on this fifth anniversary week of “Hello Gorgeous” just reinforced for me how one-of-a-kind David’s talent really is, and how utterly and divinely magical and real I found him to be. It’s amazing to me that, five years later, American Idol can’t even find someone that comes close to that moment. No wonder I’ve often held the worldview of American Idol: The era BEFORE DAVID, the era AFTER DAVID. Sadly, in this era of American Idol A.D., it’s just a real snoozer, a real disappointment, indeed a real “Vote for the Worst” contender. If things continue this way, I just might have to finally give up this bad habit of being an Idol viewer. At least this season has confirmed for me that David really did strike like lightning. You can’t package or bottle that kind of magic. Which, I imagine, is why so many of us O.D.D. fans are still here … five whole long years later. Yes, Soul Davidians, yesterday was the 5th Anniversary of David’s performance of “Heaven” during Idol’s Hollywood week, the first time ever I saw his adorable face and heard The Voice! Sorry for being a day late, but I cannot let another anniversary pass without marking the moment!